My heart is hurting today. No, I’m not having heart issues. In fact, physically, I am doing well. Spiritually my heart is hurting because of all the things that are taking place in America. It seems that we just can’t get things pulled together since President Trump came into office. As I look around I see people that are ‘talking trash’ about our President. Others are wondering when he is going to come through with the promises he made during his campaign. This is not an article on politics, but I do want to point out a reason why I feel we are in a struggle. If you look back into 2 Chronicles 7 you will find that Solomon finished building the house of the Lord. Building the house of God was important but there was something more important than that. It was being faithful to the calling of God. Let me break v.14 down. He said ‘My people’. This was in reference to His chosen people that He had brought out of Egypt, walked with through the wilderness and brought into the land of promise. ‘who are called by My name humble themselves’. This speaks of a people that are not just hanging onto their position as God’s people but are humbling themselves in their hearts and spirit. ‘And pray’. The prayer God was calling for was not just a quick prayer in the midst of a trial. It was a prayer that came forth from their hearts and acknowledged who God was, what He had done and that apart from Him they could do nothing. ‘and seek My face’ was surely found in turning toward Him in the midst of all that took place, knowing that He alone was the One who could bring them through what was taking place. ‘turn from their wicked ways’ was in reference to them walking in the way they wanted to go. It was them turning from their own will and way. ‘Then I will hear from heaven’. God was simply saying that when they acknowledged Him as their God and followed Him, that He would then hear their prayer. ‘And will heal their land’. God assured Solomon that when the people turned to Him and sought Him in the midst of all that was taking place, He would ‘heal their land’ and bring it to where it needed to be. I believe the promise to Solomon and the people of Israel is still the promise for us today. 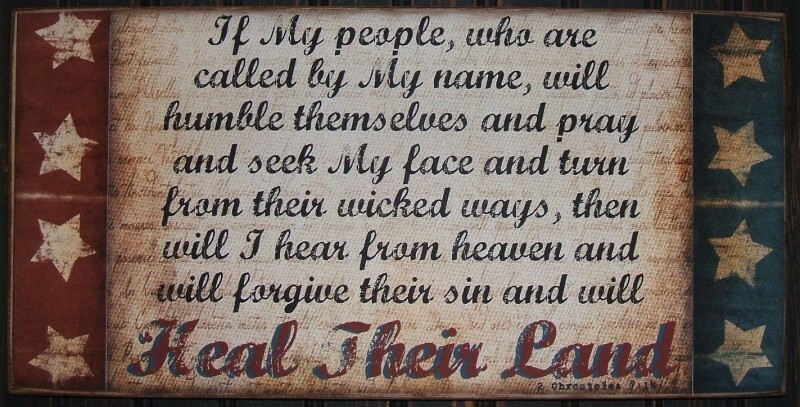 I also believe it is time that God’s people humble themselves before Almighty God, turn from our wicked ways and trust that He will hear from heaven, forgive our sin and heal our land. America needs healing. It’s time for God’s people to lead the way. God’s people must take a stand for Him regardless of what others might say. Let this be the time when we once again become ‘one nation under God’. Will you be one who leads the way?